Nothing keeps the camp vibes going through shoulder season quite like cozy campfire recipes! What’s not to love about one-pot camping recipes? With the crisp fall air upon us, bookmark this roundup of six cozy (and tasty!) 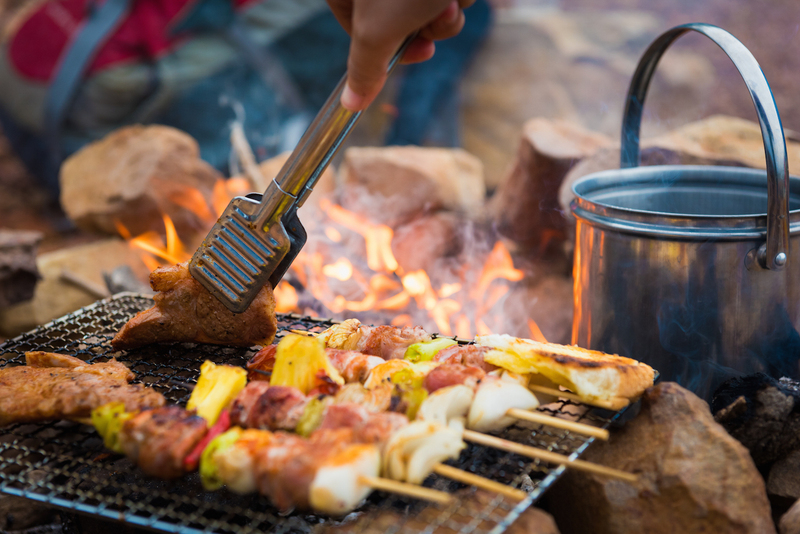 campfire meals sure to warm you up as the temperature veers to the chilly side. Which one will you cook first? We think this campfire pepperoni pizza looks so good! While pepperoni is a great choice, you can add any toppings you want to this quick and easy campfire pizza. All you really need is some pre-made pizza dough in the fridge and a pizza stone to place over the fire. Delicious! Camping meals don’t have to be bland! Prep and freeze these marinated beef kebabs before your weekend away. All you have to do when you set up your campsite is throw them on the grill. Healthy, easy and fast. Cooking eggs for a crowd can be difficult. Make your cozy campfire breakfast a little easier by cooking all the eggs in a muffin pan. Crack one egg into each muffin spot then place the entire pan over your fire. Just add toast, bacon and, of course, coffee! If you want to get really fancy, use your muffin tray campfire eggs to make a proper breakfast sandwich. What a great way to start your day! Use your same muffin tray for your campfire eggs to make these mini quiches before heading out on your camping trip. Bake a tray using the fillings you have on-hand, taste-test a couple, then flash-freeze the rest. This recipe includes microwave-reheating instructions, but you can easily warm these little taste bites over the campfire and get them nice and toasty. You can’t go wrong with bacon, beans, and ground beef on a biscuit. This cowboy casserole is hearty, delicious and easily whipped up over a crackling campfire. Cook your bacon first, then beef and beans. Toss the entire mixture on a warm biscuit. We’ll take two each, please! The ultimate cozy campfire recipe for fall: garlic fries! This easy meal is kid-friendly (feel free to skip the garlic for that picky eater in your crew). Serve as a side – or just on its own if you live for cheese-covered carbs, too! And for dessert, you need something ooey-gooey to satisfy your sweet tooth. Right? Right! Time to get cooking! If you like camping in the great outdoors, join our Wildhood Recipe Club on Facebook for heaps of camping recipe ideas and inspiration! Join our Go RVing Canada community online at Facebook, Twitter, Instagram and Pinterest.